During weekends, I like to prepare elaborate or special meals. 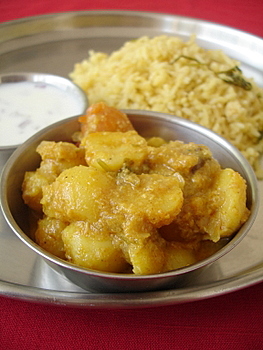 One of my best-loved meals is a coconut flavored aromatic rice with a creamy potato curry – Kobbari annam and Aloo kurma. The combination of flavors, the richness, sweetness and aroma makes the meal immensely flavorful and deeply satisfying. The fragrant coconut rice is rich and marginally sweet with green chillis adding a touch of spice. The creamy Aloo kurma is lightly spiced and a paste made of poppy seeds and coconut provides depth, texture and taste to the curry. A delectable combination that can be rustled up in under an hour! 1 Heat ghee and oil in a cooking vessel on medium heat, add the cinnamom stick, cloves, elachi and bay leaf and fry for a few seconds. Add sliced garlic and fry for half a minute. Add the green chillis and sliced onions and saute for 4 mts on medium heat. 2 Add turmeric pwd, salt and combine. Add the drained rice and fry it along with onions for a minute. Add 4 cups of coconut milk and bring to a boil. How to extract coconut milk: Grate a coconut, add 2 glasses of hot water and leave aside for 30 mts. Grind it to a fine paste. Place a muslin or thin cotton cloth on a vessel and pour this mixture onto the muslin cloth. The strained milk is called ‘first milk’ of coconut. Use your hand to squeeze out the milk from the residue. Add one more glass of water to the residue and run in the grinder for a mt. Strain on to muslin cloth. This second extract is called ‘second milk’ of coconut. 1 Heat oil in a vessel, add the chopped onions, green chillis and curry leaves and saute for 4-5 mts or till the onions turn transparent. 2 Add ginger garlic paste and fry further for another 3 mts. Add the chilli pwd, turmeric pwd, coriander pwd and salt. Combine well. 3 Add the quartered tomatoes and boiled and cubed potatoes and cook on medium heat for 6-7 mts. Reduce heat, add the ground coconut-poppy seeds paste and combine. Cook for 3-4 mts. 4 Add a glass of water, adjust salt and cook covered till you get the desired gravy consistency. 5 Garnish with fresh coriander leaves and serve with hot rotis, coconut rice or any flavored rice. 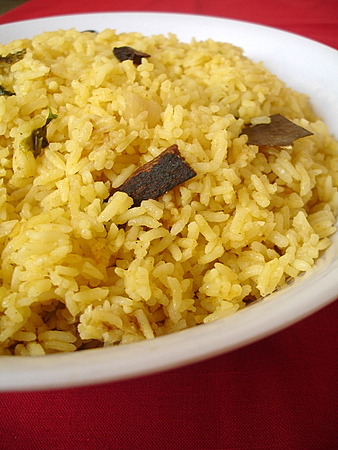 Alternately, you could vegetables of your choice for a vegetable coconut flavored rice. Once the onions are fried, add the cubed vegetables and saute for 6-7 mts and follow the rest of the above procedure. Another option is to add 1 tsp ginger garlic paste in place of the sliced garlic. Hi Sailu! Lovely combo of coconut rice and aloo kurma! looks great and excellent photography…thanks for sharing dear…. My mom makes this too 🙂 Very nice pictures! Looks delicious. wow the curry looks delicious. i dont know how u get such beautiful pics?????? Hi Sailu! I tried the rice today!! It tastes WONDERFUL! loved the creamy texture! Thank U for the simple yet super tasty recipe!! Love the coconut rice recipe, never heard this version before. Lovely combo. 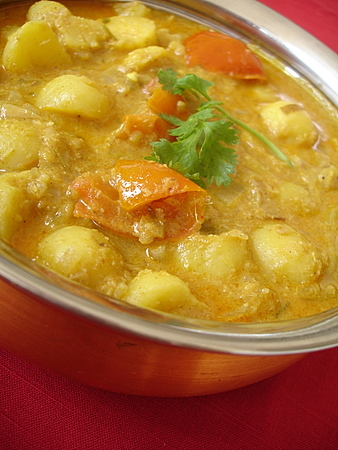 Aloo kurma looks simply superb. This is so yummy. We had this for lunch today. It was awesome. Thank you so much for the lovely recipe. You have a lovely website here. Great work! That is an amazing combo, i must say the meal looks simply irresistible! Thank you so much for ur support. i am a male bachelor and i iam cooking myself in my room. i am pursuing my mca. i have so much interest in cooking and your site is so helpful to me in preparing my daily food and also few varieties during weekends. pls send me ur tasty and wonderful dishes and give a chance to taste it. once again thank you so much. keep sending me mails. Great meal for a lazy afternoon. I don’t think I’ve ever made coconut milk actually. Is it miles better than the tinned stuff? It looks soo delicious. I will definitely have to attempt this dish , Sailu. Good work..keep it up. Yummy recipe.I like your way of explaining very small points.Keep it up. Sailu, Delicious recipe. Thanks alot. I had a tough time making poppy seeds as smooth paste.. Do you have any tip for that? This is my first comment and wanted to let you know I have just started my blog today. I have always enjoyed reading your blog and filled my kitchen with mouthwatering food using your recipes. I want to make kurma today. I have a question that what variety is the Potato you used in your receipe? Because in USA so many varieties and different sizes of potatoes available. Its confusing to use which one i have to use? please clarify me. hi…just wanted to let you know, I have started a blog too. Please visit and leave your comments. Thank you. The pictures look so good that I had to make Veggie Pulav and Aloo Kurma the same day and it turned out great. Amazing recipes and beautiful pictures ! Yummy recipe. I always make the aloo kurma but i never used freshly grated coconut. Iam defnetly going to make this and let you know how it tasted. This is the kind of meal I can eat daily and never get tired of it. I tried the korma… it was awesome! If store bought then dilute with water, Sapna. That looks delecious! surely try it. Just amazing recipe and photographs….Looks Tempting….I have a few favourites from ur website…can i add them to my blog with a link t urs? Cooked this y’day for dinner, it was a super tasty !! This is a nice meal, also less time consuming. hai sailu ur doing a goodjob.thanks for sharing.may i know what are poppy seeds.plz do reply me. hi sailu i made this alu curry today and i added 1 capsicum to ur recipe. It turned out tasty.Had it with rotis. Great Going!! I tried this Kobbari annam yesterday and it came out wonderful. Thank you for this recipe. Everyone in my home liked it very much. Believe it or not we eat the rice without any curry or gravy to go with it. Also I had no time to prepare curries in the morning as we all have to leave home by 7am. I did not add onions as it is summer here in the middle east and the food tends to get spoilt very quickly and also coconut has a tendency to get the food spoilt quickly. Once again thank you for this wonderful and easy recipe. Wish to receive your response at least for one of my emails. I am so impressed with your website which is so helpful and easy to make. Thank you so much for all your hardwork, time and your creativity. I really appreciate your efforts to bless people like me. I made this recipe for the first time and it came out exactly the way you mentioned. My husband who is an american and other american ladies enjoyed it very much and I have forwarded them the recipe as well. Wonderful Pics… Mouth Watering Recipe.. Cannot wait to try it out. Thanks Sailu. Super dish we liked it a lot. . . . . . . yummy yummy. . . . . .
Hi Sailu – I tried 4 cups of diluted store bought coconut milk in the kobbari annam recipe. Something about the texture of the rice was off. It got really dry, and gooey – would this need more than 4 cups water? I made this for a friend that was visiting, and she seemed to like it nevertheless! If its gooey, then less water would be required. If using Basmati rice, for 2 cups of rice, use 3 1/2 cups of water/coconut milk. 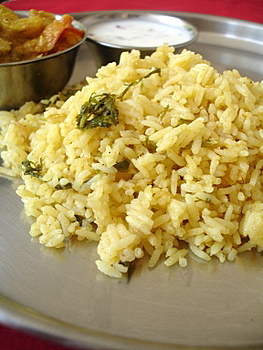 For Sona Masuri or other varieties of rice, for 2 cups of rice use 4 cups of water/coconut milk. Soak rice for 15 mts prior to cooking. Hope this helps, Sirisha. I do add tomatoes sometimes. It definitely enhances the flavor. Hi Sailu,Just about to try your recipe. Hi Sailu – I love your blog! Your recipes are exactly like my mom’s, except they are more detailed than “put a little elaichi”, which is how my mom explains it! I dont live in India now, so whenever I feel homesick I read your blog and feel nostalgic! Thanks for your great work! If I use Basmathi rice, how much coconut milk, i should use ? I made this for dinner today..both was simple quick and really tasty..just added some fried cashew nuts to the rice and a bit more spice for the gravy..my family loved it.. Which rice tastes better basmati or normal rice? Both work equally good. I usually use normal rice or jeera rice.